Статья на английском, ее перевод на русский сделанный онлан переводчиком гугл можно прочесть ниже здесь. В перводе не все понятно, есть просто ошибки, например размеры и вес, будет время, улучшим. Сможете Вы лучше, присылайте, размещу ваш вариант перевода. Статья интересна хотя бы тем, что Норман Айзенберг (Norman Eisenberg) и Лен Фельдман ( Len Feldman), ведущие колонку Lab Report журнала Modern Recording и занимающиеся именно опытной проверкой аудиоаппаратуры и соответствия заявленных произодителями характеристик реальным. General Description: The Sansui B -1 is a stereo power amplifier rated conservatively for an output of 250 watts per channel into 8 -ohm loads, or 350 watts per channel into 4 -ohm loads. Loads lower than 4 ohms are not recommended. Of rack -mount width, the front panel has slotted ends and handles. Peak-power meters monitor the output on each channel. Meter scales provide dB and wattage readings, with «zero dB» representing 250 watts for 8- ohm loads. With other load values, the indicated wattage reading must be mentally changed. That is, 4- ohm loads double the wattage scale; 16 -ohm loads halve it. A peak-hold switch may be used to keep the peak reading on the scale for about 15 minutes. Below each meter is an input level control for that channel. Between the meters are individual channel overload indicators, a thermal indicator and an indicator for the built -in two -speed fan. This fan will come on auto- matically at a given temperature level. In addition, it may be turned on manually at any time by a switch on the front panel. Additional front-panel features include a switch to activate a subsonic filter; a speaker selector switch that chooses one or both pairs of speakers that are con- nected at the rear; and the power off /on switch. Associated with the power switch is an indicator that blinks when the amplifier is first turned on and then glows steadily. In the event of a malfunction, a short in the output load, or DC voltages appearing in the output, this indicator will start to blink again. At the rear, the input and output connections for each channel are mirror- images of each other. Inputs are unbalanced but include 1/4-inch phone jacks as well as XLR sockets. Speaker outputs, for main and extra stereo pairs, are knurled -nut screw posts. There also is, for each channel, a set of screw -terminals marked for 70.7 -volt output. These terminals do not furnish the 70.7 -volt output but are provided as a convenience in adding an optional transformer (Sansui model B -LT -1) that will furnish the 70.7 -volt output if needed for multiple speaker hookups on each channel. Each channel also has a «DC /AC» switch that permits the Model B -1 to operate either as a direct — coupled amplifier, or with the necessary coupling capacitors in the input stages that would block any DC voltages present in the input signal. Each channel also has its own grounding terminal. Centered between the two connector areas is a metal screen that covers the fan. The amplifier’s power cord is fitted with a three — prong grounding plug. Test Results: In our lab tests, the Sansui B -1 easily met or exceeded its published specifications. Power output went well above rated output for rated distor- tion, while distortion for rated output was lower than claimed. One of Sansui’s specs is for TIM (transient intermodulation distortion), for which Sansui has developed its own method of measuring. It differs from the so -called Otalla method that has become popular with several manufacturers. While TIM is not included in our «Vital Statistics» chart, our lab is equipped to measure it using the Sansui method. On the individual data sheet enclosed with our test sample, TIM was listed as 0.0100 percent and 0.0088 percent for left and right channels, respectively. Our results were amazingly close, with readings of 0.0100 percent and 0.0093 percent for left and right channels, respectively. The subsonic filter, activated by the front -panel switch, had its 3 -dB cutoff point set precisely at 20 Hz. This option is a nice touch, over and above the action of the «DC /AC» switches at the rear. Combined with the other safety and self -ventilating features built into the amplifier, it should assure against various possible bugs or subsonic garbage interfering with normal operation. General Info: Dimensions are 19 inches wide; 7 » 4s inches high; 19’%6 inches deep. Weight is 60 pounds. Price is $1200. 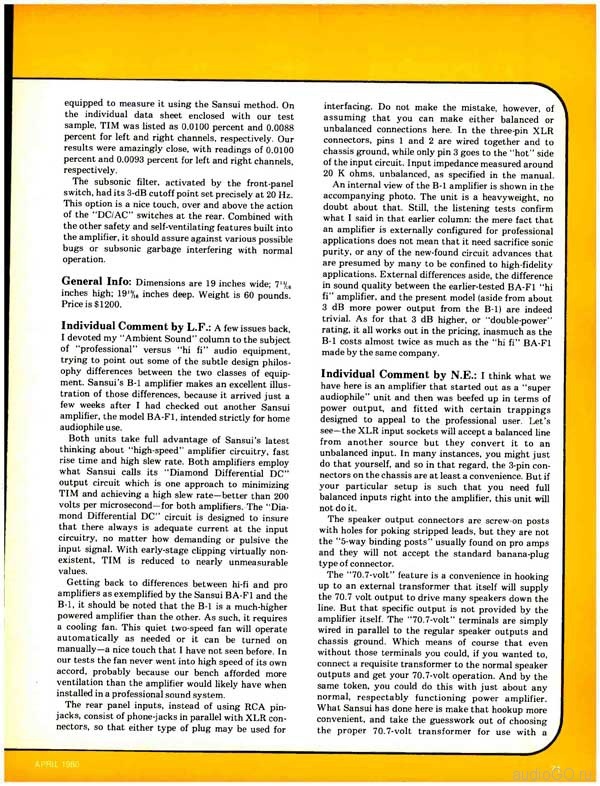 Individual Comment by L.F.: A few issues back, I devoted my «Ambient Sound» column to the subject of «professional» versus «hi fi» audio equipment, trying to point out some of the subtle design philos- ophy differences between the two classes of equip- ment. 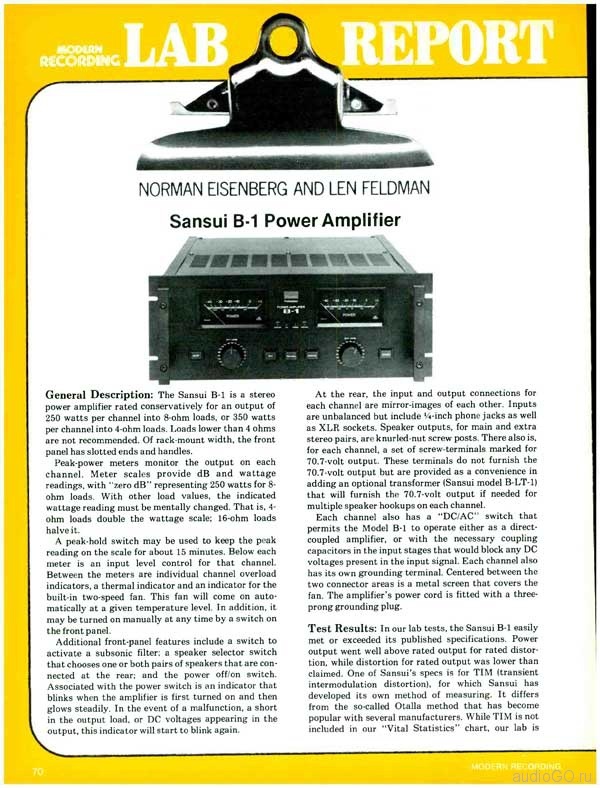 Sansui’s B -1 amplifier makes an excellent illus- tration of those differences, because it arrived just a few weeks after I had checked out another Sansui amplifier, the model BA -F1, intended strictly for home audiophile use. Both units take full advantage of Sansui’s latest thinking about «high- speed» amplifier circuitry, fast rise time and high slew rate. Both amplifiers employ what Sansui calls its «Diamond Differential DC» output circuit which is one approach to minimizing TIM and achieving a high slew rate -better than 200 volts per microsecond -for both amplifiers. The «Dia- mond Differential DC» circuit is designed to insure that there always is adequate current at the input circuitry, no matter how demanding or pulsive the input signal. With early -stage clipping virtually non- existent, TIM is reduced to nearly unmeasurable values. Getting back to differences between hi -fi and pro amplifiers as exemplified by the Sansui BA -F1 and the B -1, it should be noted that the B -1 is a much -higher powered amplifier than the other. As such, it requires a cooling fan. This quiet two -speed fan will operate automatically as needed or it can be turned on manually -a nice touch that I have not seen before. In our tests the fan never went into high speed of its own accord, probably because our bench afforded more ventilation than the amplifier would likely have when installed in a professional sound system. The rear panel inputs, instead of using RCA pin — jacks, consist of phone -jacks in parallel with XLR con- nectors, so that either type of plug may be used for interfacing. Do not make the mistake, however, of assuming that you can make either balanced or unbalanced connections here. In the three -pin XLR connectors, pins 1 and 2 are wired together and to chassis ground, while only pin 3 goes to the «hot» side of the input circuit. Input impedance measured around 20 K ohms, unbalanced, as specified in the manual. 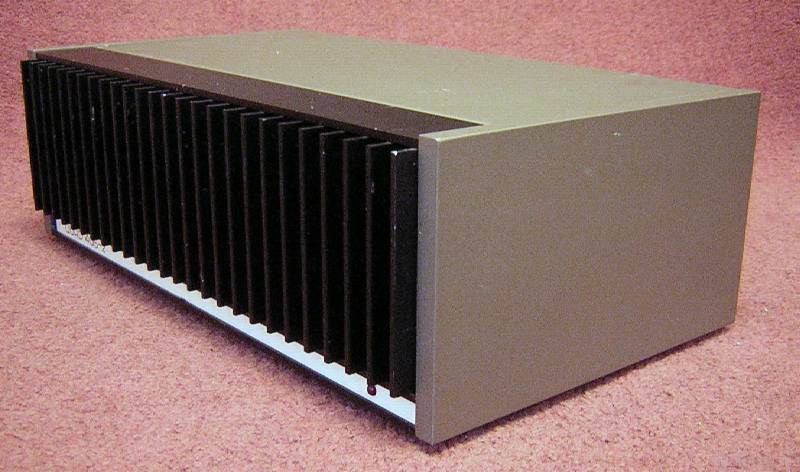 An internal view of the B -1 amplifier is shown in the accompanying photo. The unit is a heavyweight, no doubt about that. Still, the listening tests confirm what I said in that earlier column: the mere fact that an amplifier is externally configured for professional applications does not mean that it need sacrifice sonic purity, or any of the new -found circuit advances that are presumed by many to be confined to high -fidelity applications. External differences aside, the difference in sound quality between the earlier- tested BA -F1 «hi fi» amplifier, and the present model (aside from about 3 dB more power output from the B -1) are indeed trivial. As for that 3 dB higher, or «double- power» rating, it all works out in the pricing, inasmuch as the B -1 costs almost twice as much as the «hi fi» BA -Fl made by the same company. Individual Comment by N.E. 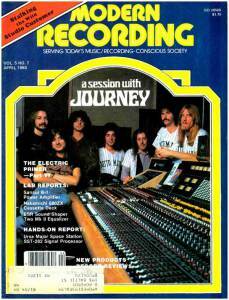 : I think what we have here is an amplifier that started out as a «super audiophile» unit and then was beefed up in terms of power output, and fitted with certain trappings designed to appeal to the professional user. Let’s see -the XLR input sockets will accept a balanced line from another source but they convert it to an unbalanced input. In many instances, you might just do that yourself, and so in that regard, the 3 -pin con- nectors on the chassis are at least a convenience. But if your particular setup is such that you need full balanced inputs right into the amplifier, this unit will not do it. The speaker output connectors are screw -on posts with holes for poking stripped leads, but they are not the «5 -way binding posts» usually found on pro amps and they will not accept the standard banana -plug type of connector. The «70.7- volt» feature is a convenience in hooking up to an external transformer that itself will supply the 70.7 volt output to drive many speakers down the line. But that specific output is not provided by the amplifier itself. The «70.7- volt» terminals are simply wired in parallel to the regular speaker outputs and chassis ground. Which means of course that even without those terminals you could, if you wanted to, connect a requisite transformer to the normal speaker outputs and get your 70.7 -volt operation. And by the same token, you could do this with just about any normal, respectably functioning power amplifier. What Sansui has done here is make that hookup more convenient, and take the guesswork out of choosing the proper 70.7 -volt transformer for use with a particular amplifier. 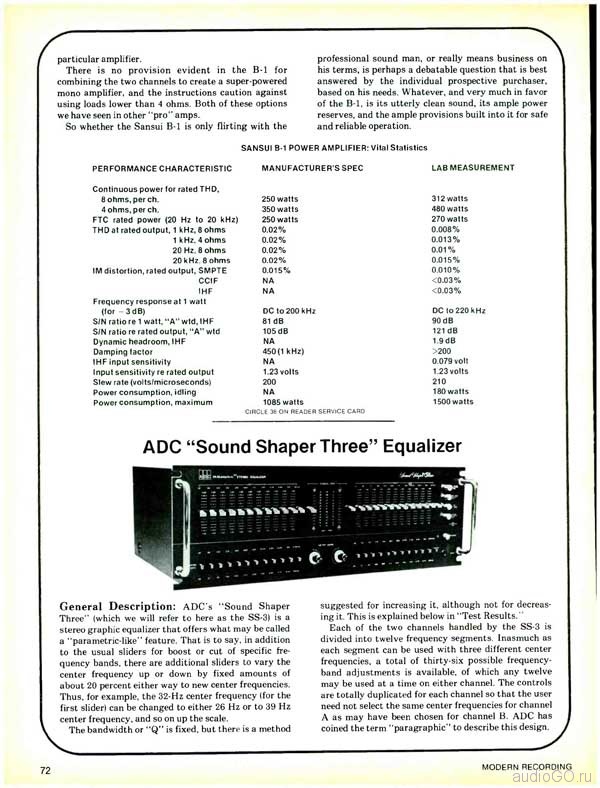 There is no provision evident in the B -1 for combining the two channels to create a super- powered mono amplifier, and the instructions caution against using loads lower than 4 ohms. Both of these options we have seen in other «pro» amps. So whether the Sansui B -1 is only flirting with the professional sound man, or really means business on his terms, is perhaps a debatable question that is best answered by the individual prospective purchaser, based on his needs. Whatever, and very much in favor of the B -1, is its utterly clean sound, its ample power reserves, and the ample provisions built into it for safe and reliable operation. перевод статьи сделанный бесплатным онлайн перводчиком Googl, сможете лучше, присылайте, размещу ваш. Общее описание: Sansui B -1 усилитель номинальная мощность консервативно для вывода 250 Вт на канал на 8 -ohm нагрузок, или 350 Вт на канал при 4 -ohm нагрузок. Грузы ниже, чем 4 Ом не рекомендуется. Из стойки -mount ширины, передняя панель с прорезями концы и ручки. Пик-измерители мощности контролировать выход каждого канала. Метр весам дБ и мощность показания, с «нуля дБ», представляющей 250 Вт для 8-ми Ом нагрузки. С другими значениями нагрузки, указанный чтение мощность должна быть мысленно изменен. То есть, грузы 4- Ом удвоить шкалу потребляемой мощности; 16 -ohm нагрузки вдвое его. Переключатель удержания пика может быть использована, чтобы держать пик чтения по шкале в течение примерно 15 минут. Под каждым метр управления входной уровень для этого канала. Между метров индивидуальные показатели перегрузки канала, термоиндикатор и индикатор для встроенного -в два -speed вентилятора. Этот вентилятор придет на автоматически на заданном уровне температуры. Кроме того, он может быть включен в любой момент вручную с помощью переключателя на передней панели. Дополнительные функции фронт-панели включают переключатель, чтобы активировать инфразвуковой фильтр;Переключатель спикер, который выбирает одну или обе пары динамиков, которые подключены с тыльной стороны; и выключение / включение выключателя. Связанное с помощью выключателя питания является показателем того, что мигает, когда усилитель первом включении, а затем горит постоянно. В случае неисправности, короткое замыкание в выходной нагрузки, или постоянного тока напряжением, появляющихся на выходе, этот показатель начнет мигать снова. На задней панели, входные и выходные соединения для каждого канала зеркально образы друг друга. Входы являются несимметричными, но включают 1/4-дюймовые телефонные гнезда, а также XLR разъемы. Выходы на акустические системы, для основных и дополнительных стерео пары, которые накатанной -гайкой сообщения винт. Там тоже есть, для каждого канала, набор винтов -terminals отмечены 70,7 выходе Вольт. Эти терминалы не предоставите выход 70,7 Вольт, но предоставляются для удобства при добавлении дополнительного трансформатора (Sansui модель B -Это -1) это даст выход 70,7 Вольт при необходимости для нескольких приставок колонок на каждом канале. Каждый канал также имеет переключатель «DC / AC», который позволяет Образец B -1 действовать либо как прямой — в сочетании усилителя, или с необходимыми конденсаторов во входных этапов, которые будут блокировать любые напряжения постоянного тока, присутствующих во входном сигнале. Каждый канал также имеет свой собственный терминал заземления. По центру между этими двумя областями разъем металлический экран, который охватывает вентилятор. Кабель питания усилителя оснащена тремя — заземления вилки зубцами. Результаты тестов: В наших лабораторных тестов, Sansui B -1 легко достигнуты или превышены опубликованным спецификациям. Мощность пошел намного выше номинала для номинального искажению, а искажения для номинальной мощности был ниже, чем заявлено. Один из спецификации Sansui является для TIM (переходное интермодуляционных искажений), для которых Sansui разработал свой собственный метод измерения. Она отличается от так -called метода Otalla, которая стала популярной с несколькими производителями. В то время как TIM не входит в наш «Vital Statistics» графика, наша лаборатория оснащена для измерения ее с помощью метода Sansui. На индивидуальном листе технических данных, прилагаемого нашем тестовом образце, TIM был внесен в список 0,0100 процента и 0,0088 процента для левого и правого каналов, соответственно. Наши результаты были удивительно близки, с показаниями 0,0100 процента и 0,0093 процента для левого и правого каналов, соответственно. Инфразвуковой фильтр, активируется передний переключатель -ПЕРЕВОРОТНЫЕ, имел его 3 -dB точка отсечки устанавливается точно на 20 Гц. Эта опция приятно прикасаться, сверх действием переключателей «DC / AC» в тылу. В сочетании с другими функциями безопасности и самоуправления -ventilating, построенных на усилитель, она должна обеспечить против различных возможных ошибок или дозвуковой мусора, мешающих нормальной работе. Общая информация: Размеры 19 см в ширину; 7 «4s дюймов в высоту; 19 ‘% 6 дюймов глубиной. Вес 60 кг. Цена составляет $ 1200. Индивидуальный Комментарий LF: Несколько вопросов назад, я посвятил свою колонку «окружающего звука» к теме «профессиональный» против «Hi-Fi» звукового оборудования, пытаясь указать на некоторые из тонкой конструкции философию, ophy различия между этими двумя классами из оборудования. B -1 усилитель Sansui делает отличную Для иллюстрации этих различий, потому что он прибыл всего через несколько недель после того как я проверил другой усилитель Sansui, модель бакалавра -f1, предназначенный исключительно для домашнего использования аудиофилов. Оба устройства в полной мере воспользоваться последними мыслями Sansui о «высокой скорости» схеме усилителя, быстрым временем нарастания и высокой скоростью нарастания. Оба усилителя используют так Sansui называет его «Алмаз по постоянному току,» выходной контур, который является одним из подходов к минимизации Тим и достижения Высокая скорость нарастания -Лучше, чем 200 вольт в микросекунду -для обоих усилителей.Схема «алмаза Дифференциальная DC» предназначен для обеспечения того, чтобы там всегда достаточно тока на входной цепи, независимо от того, как требовательный или импульсивных входного сигнала. С раннего -ступенью отсечения практически несуществующим, TIM сводится к почти неизмеримых величин. Возвращаясь к различиям между хай -fi и про усилителей примером которых может служить Sansui BA -f1 и B -1, следует отметить, что B -1 гораздо -higher питание усилителя, чем другой. Как таковой, он требует охлаждающий вентилятор. Этот тихий два-ступенчатая вентилятор будет работать автоматически по мере необходимости, или он может быть включен вручную -a приятно прикасаться, что я не видел прежде. В наших тестах вентилятор никогда не ходил в высокой скорости по своей собственной воле, вероятно, потому, что наша скамейка предоставлена дополнительная вентиляция чем усилитель, скорее всего, имеют при установке в профессиональной звуковой системы. Задние входы панели, вместо того чтобы использовать RCA ПИН — гнезда, состоят из телефонных -jacks параллельно с XLR разъемов, так что любой тип пробки могут быть использованы для сопряжения. 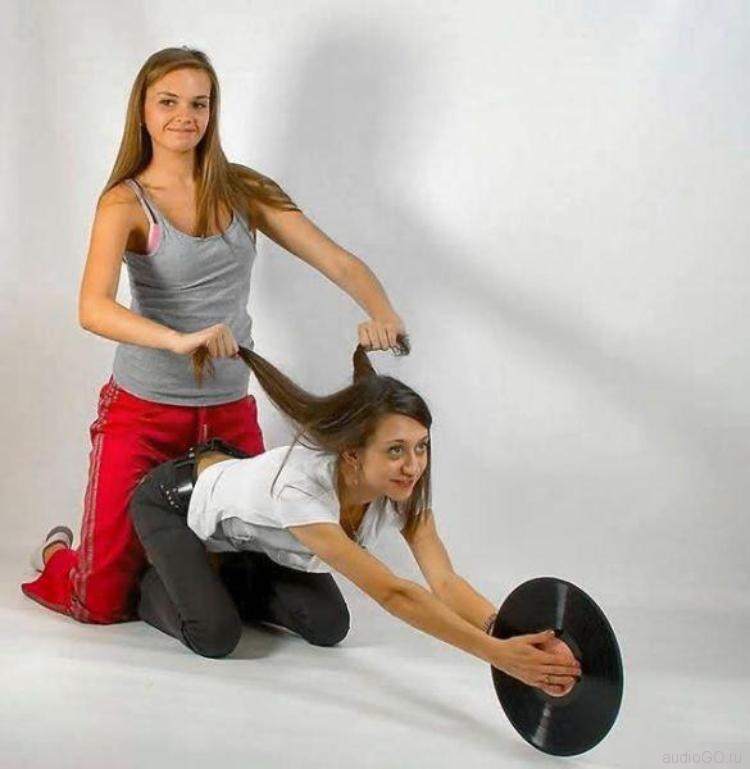 Не делайте ошибку, однако, при условии, что вы можете сделать симметричные или несимметричные соединения здесь. В течение трех-контактный разъемы XLR, выводы 1 и 2 соединены друг с другом и к заземлению шасси, в то время как только контакт 3 идет в «горячей» стороне входной цепи. Входное сопротивление измеряется около 20 кОм, несимметричный, как указано в руководстве. Внутренний вид усилителя B -1 показан на прилагаемом фото.Устройство супертяжелом, нет никаких сомнений, что. Тем не менее, тесты прослушивания подтвердить то, что я сказал в этой предыдущей статье: Тот факт, что усилитель внешне, настроенный для профессиональных приложений, не означает, что нужно пожертвовать чистоту звука, или любой из новых -found достижений схема, которая, как предполагается многими должна быть ограничена высокими приложений -fidelity. Внешние отличия в сторону, разница в качестве звука между earlier- испытания BA -f1 «Hi-Fi» усилителя, и данной модели (кроме примерно на 3 дБ больше мощности от B -1) действительно тривиально. Что касается этого 3 дБ выше, или «двойной мощности» рейтинг, все это работает в области ценообразования, поскольку в B -1 стоит почти в два раза больше «Hi-Fi» BA -FL из той же компании. Индивидуальный Комментарий NE: Я думаю, что мы имеем здесь дело усилитель, который начинал как «супер аудиофилов» единицы, а затем был доукомплектован с точки зрения мощности, и оснащены определенных атрибутов, предназначенных для обратиться к профессиональному пользователю. Давайте посмотрим, -The входные разъемы XLR примет сбалансированную линию от другого источника, но они преобразовать его в несбалансированной входа. Во многих случаях, вы можете просто сделать это самостоятельно, и поэтому в этом отношении, 3-контактный разъемы на шасси, по крайней мере удобство. Но если ваш частности установка такова, что вам нужно полностью симметричными входами прямо в усилитель, устройство не будет это делать. Выходные спикер разъемы винтовые -на сообщений с отверстиями для тыкая зачищенные провода, но они не являются «5 -позиционной обязательные сообщения» обычно находятся на профессиональный усилителей и они не будут принимать стандартный банан Подключи тип разъема. «70.7- вольт» функция удобство в подключения к внешним трансформатором, что само по себе будет поставлять мощность в режиме 70,7 вольт проехать много динамики по линии. Но что удельная мощность не предусмотрено самим усилителем. Зажимы «70.7- вольт» просто подключены параллельно к регулярным выходы на акустические системы и шасси. Это означает, конечно, что даже без этих терминалов вы можете, если вы хотите, чтобы, подключите необходимые трансформатор нормальных выходы на акустические системы и получить вашу деятельность 70,7 Вольт. И к тому же, вы можете сделать это с любой нормальной, достойно функционирования усилителя мощности. Что Sansui сделал здесь, это сделать что приставка удобнее, да и взять наугад из выбора правильного трансформатор 70,7 Вольт для работы с конкретным усилителем. Там нет положения проявляется в B -1 для объединения двух каналов для создания супер- питание моно усилитель, и инструкции предупреждают против использования грузы ниже, чем 4 Ом. Оба этих варианта, которые мы видели в других «Pro» усилителей. Так ли Sansui B -1 только заигрывание с профессиональной звуковой человек, или на самом деле означает бизнес на его условиях, является, пожалуй вопрос спорный, что лучше всего ответить, индивидуального потенциальному покупателю, исходя из его потребностей. Независимо, и очень в пользу B -1, является его совершенно чистый звук, его богатые запасы мощности, а широкие положения, встроенные в него для безопасной и надежной эксплуатации. Очень приятная статья,подтверждающая мои личные ощущения от общения с Сансуи В1. *в пользу B -1, является его совершенно чистый звук, его богатые запасы мощности, а широкие положения, встроенные в него для безопасной и надежной эксплуатации. *-полностью поддерживаю уважаемого автора!ПС.Выражаю благодарность Audiomarker за постоянную поддержку моих тем!